So… I do have a few mixed feelings about this book. 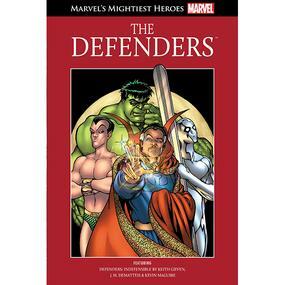 With the exception of the Silver Surfer, I’ve seen the other three members of the Avengers in their own books in this collection. I do find Namor really hard to relate to. Although some of the banter between him and Doctor Strange was amusing, I think Bruce was the only character who seemed ‘human’. I wasn’t sure what to make of the Silver Surfer, though. He didn’t come across as very heroic in the set of comics here. The fact that three heroes who really didn’t get on were forced into saving the world was a pretty interesting one. The brother and sister villains were really quite interesting… though they both come across as really psychotic for most of the book. And I didn’t really like seeing Umar and Bruce together. While I did find Umar more interesting than her brother, I definitely couldn’t see her as being superhero material. I did think it was interesting to see the different versions of the characters in Dormammu’s universe. I was especially amused by the version of Spider-Man. I could see elements of the real Peter Parker coming through. The artwork in this comic book was pretty interesting and I did like seeing Namor talking to the version of himself. There were a couple of moments where I found myself smiling at some of the one-liners in the comic book and it was interesting to see different versions of the three main characters in the world. I felt really sorry for the Bruce Banner in the other world… but much less so for Doctor Strange’s doppelganger. And it was good to see the slightly different version of Namor… and how he actually seemed to care more than the Sub-Mariner did. The Silver Surfer didn’t really seem to change much in either incarnation and I wasn’t sure what the point of including him was. I liked seeing Hulk as apparently more than just a mindless beast and that, although he didn’t have as big a part as the other characters, I did like that he was included. I just found the other characters really hard to relate to… arrogance isn’t really an appealing trait. I don’t think I’ll go out and buy more comic books focusing on them.